Make the most of meal prep! 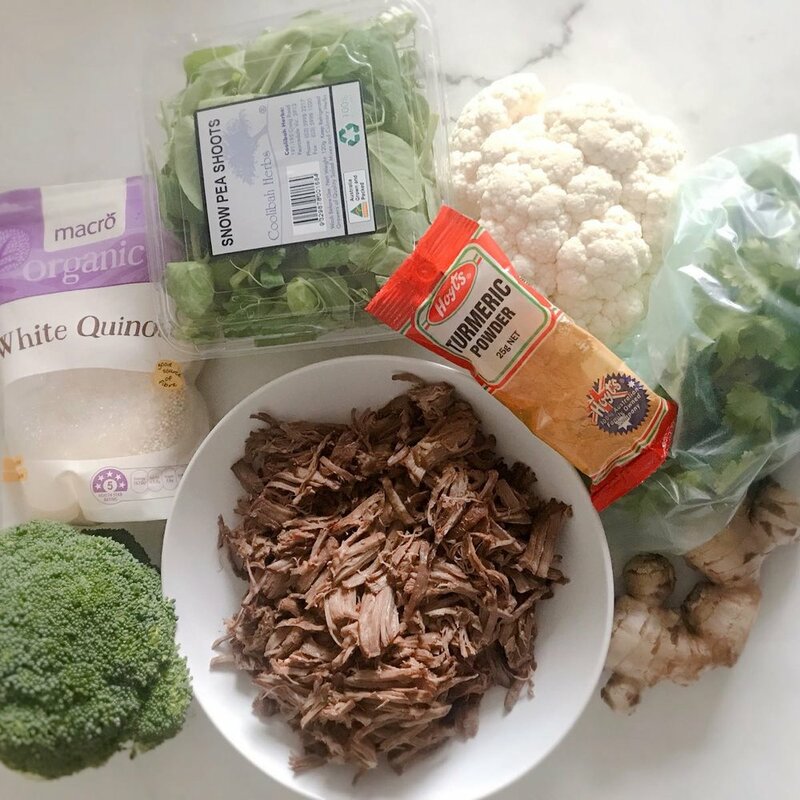 Combine slow cooked, shredded beef with cauliflower cooked with turmeric and ginger to create a ‘superfood’ powered dinner within 15 minutes. Slow cooking beef in a tomato-based sauce, but then storing them separately turned into a bonus. Originally planning on making beef enchiladas I was stopped in my tracks when I found I had run out of tortillas and wraps. I’d batch cooked a large amount of beef so that I could have a healthy protein on hand that I could freeze in batches and use to make quick and easy meals. But enchiladas is what I was really craved. When I found I couldn’t make these I was really stuck. After lots of opening and closing the cupboard, waiting for a miracle idea to appear I decided to use up the cauliflower that I’d bought with the best of intentions, but a week later was still languishing in the fridge. To make it interesting I threw in some fresh ginger and turmeric. The snow pea sprouts didn’t get used, and I added lemon that I did have. Pine nuts would have turned this from good to sensational! >> What would you have made if you had these ingredients on hand? Would love to know if you have time to leave your ideas in the comments section. In this instance I cooked more cauliflower than I would use so that I would have ‘prepped’ cauliflower on hand for other meals. If you don’t have cooked quinoa or rice on hand, start cooking this now. Then gently heat a small amount of olive oil in pan and lightly fry freshly grated ginger with the turmeric and roughly chopped coriander root. When the quinoa is cooked, add cooked quinoa and beef to the pan warm through so the beef and cauliflower are warm. Toss through chopped coriander leaves and serve. As you can see this is not a proper ‘recipe’. Rather general guidelines to explain how to create this meal. It is assumed you will add quantities literally based on how hungry you are! To vote to have this meal made into a formal recipe with exact instructions and quantities, leave a comment below. This meal could also be made with shredded pork or chicken. I cooked extra cauliflower for use in meals during the week. If the quinoa had already been prepped and cooked this would have been a healthy, filling, tasty meal made in 10 minutes in one pan. Like shredded meat such as pulled pork? Read this post for 5 ideas for meals using pulled pork.